Former New York Jets lineman Nick Mangold shares why he was invited to the 2019 NFL Combine as a mentor to the upcoming rookie class. It's been a few years since former Jets center Nick Mangold played his final NFL game, but he's keeping himself involved. Mangold is in Indianapolis to help mentor draft prospects at the NFL Combine as part of the NFL Legends Community. The seven-time Pro Bowler is giving advice to offensive linemen. "I'm here as a resource," Mangold told SNY's Jeane Coakley. "I'm not affiliated with the league, I'm not affiliated with any team, so if guys have questions that they don't want to ask that they might think is stupid or can cause problems, they ask me. So it's been a good experience." After announcing his retirement, New York Jets great Nick Mangold sits down with SNY to talk about his career and future. After spending eleven seasons with the Jets, Nick Mangold announces his retirement from the NFL. Nick Mangold, who spent 11 seasons with the Jets, announced his retirement at the team's facility after signing a one-day contract on Tuesday. The Daily News Live panel discusses Jets center Nick Mangold officially announcing his retirement and looks back on his legendary career. After a year out of football, No. 74 is officially hanging up the cleats. Ralph Vacchiano | Facebook | Twitter | Archive: On the lists of favorite players and all-time greats, you'll rarely find a center. They're buried in the trenches, often noticed only when a bad snap happens or a defensive tackle breaks through. The same was probably true for Nick Mangold during his 11 NFL seasons - rarely noticed from the outside and incredibly underappreciated game to game. Yet somehow he still emerged from his long career as a fan favorite. And he definitely emerged as one of the Jets' all-time greats. The next stop for David Harris figures to be the Jets' Ring of Honor. Harris, who spent 10 years as the anchor of the Jets defense before he was released last year, announced his retirement from the NFL on Friday afternoon. The 34-year-old inside linebacker ended his 11-year career through a short statement released by his agent on Twitter, less than three weeks after reaching the first Super Bowl of his career with the New England Patriots - although he wasn't activated for the game. Former Jets C Nick Mangold was thinking about starting his political career, and running in his local GOP primary, according to Politico's Matt Friedman. However, Mangold said Thursday that he will not be running. 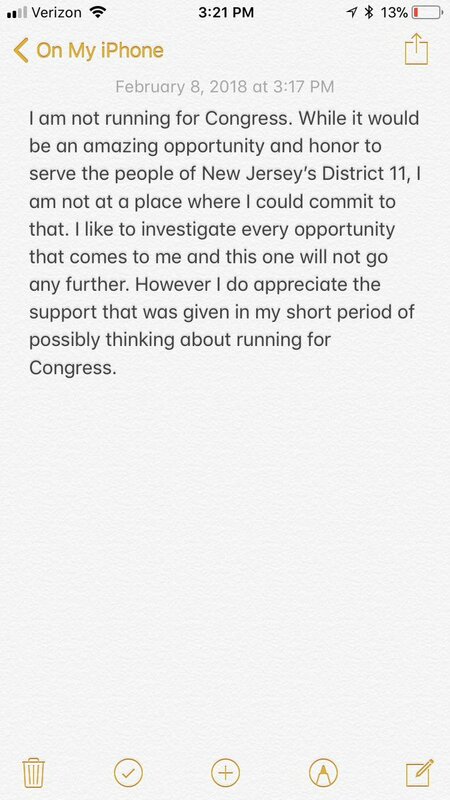 Mangold would've been running to replace the retiring Rep. Rodney Frelinghuysen, who represents the 11th District of New Jersey. Essex County Republican Chairman Al Barlas has spoken with Mangold, and he appears to be serious about running for the position. Former Jets center Nick Mangold is undecided if he'll return to football next season after sitting out 2017. Mangold, 34, was released by the Jets last offseason to save $9.1 million in cap space. He last played in 2016 when he made just eight starts, the only time in his career that he missed more than two games in a season. "[I'm] in football purgatory. I'm not up and I'm not down. I'm somewhere in between, all over the place," Mangold said on The Michael Kay Show. "My foot is starting to feel better. I'm starting to get back into things. Is this something I still want to do? I don't know where I am." Jonas Schwartz and Willie Colon return on the heels of another Jets victory. The guys look back at the Jets' win over the Jags, their 2-2 record, and how the locker room is much lighter this season than last. Plus, former Jets center Nick Mangold calls in to talk about his departure from the team, and later, Rich Cimini of ESPN hops on the phone to give his take on Muhammad Wilkerson. Former Jets C Nick Mangold is still feeling the impact of his release and is not sure he will return to the NFL, he said during SNY's "Jet Stream" podcast. Speaking of his son, Mangold said his departure from the Jets was "difficult emotion to deal with. You have the pain of being cut, but you see the joy in his eyes." Jets DE Sheldon Richardson says head coach Todd Bowles has been more strict than in the past, per Darryl Slater of NJ.com. Bowles has been left with a young team following the Jets' roster purge that including veterans like C Nick Mangold and LB David Harris. With his job possibly in jeopardy, he has been putting emphasis on working harder. "It's completely different from the last couple years," Richardson said at minicamp. "A lot more strict now. We weren't loose [in the past], but it's a lot more strict now. It's even more enforced than what it has been in the past." Former Jets center Nick Mangold is making his first known free-agent visit to meet with the Baltimore Ravens on Wednesday, according to a report. The 33-year-old, who was released by the Jets in February, was expected to arrive in Baltimore late Tuesday night, according to ESPN. The Ravens traded their starting center, Jeremy Zuttah, to the San Francisco 49ers last month but did not bring in a replacement. They do have two in-house candidates - John Urschel and Ryan Jensen, both of whom are 25. If healthy, the 33-year-old Mangold could conceivably compete for that job, or at least provide a veteran mentor to help the young centers. The Giants are interested in former Jets C Nick Mangold, Daily News writer and SNY contributor Pat Leonard reports. Mangold, 33, was released by the Jets on Feb. 25 after spending 11 seasons with them. He played eight games last season while dealing with an ankle injury. Mangold, who has been selected to the Pro Bowl seven times, played in 62 of 64 regular season games for the Jets between 2012 and 2015. Jets head coach Todd Bowles talks about the team's decision to release Darrelle Revis and how the team plans to use FA to find a QB. INDIANAPOLIS - It's hard to imagine a worse spot for Todd Bowles. The glow of his first-year success evaporated in last year's 5-11 disaster. His job could be on the line this season, for real, with no promises from his owner of the future. His team has no quarterback. It's shedding many of its past leaders. In other words, Bowles might very well be in a win-now position as his team is in the midst of a total rebuild. The Jets cut longtime center Nick Mangold in an attempt to clear cap space. Nick Mangold, the center of the Jets' offensive line for more than a decade and "a cornerstone" of the franchise, in the words of owner Woody Johnson, is the latest casualty of the Jets' most recent attempt to rebuild. The 33-year-old Mangold was officially released on Saturday in an expected, but still difficult move. He called it a "sad day" in his farewell post on Twitter, after being released by the only team he's played for since the Jets drafted him in the first round back in 2006. Coming off a miserable season, the Jets are in a difficult offseason position. They don't project to have much cap room, at least until they start cutting some high-priced players. And whatever cap room they do create might have to be spent on the quarterback they so obviously and desperately need. And since they'll have to replace many of the players they cut, they may not have much room to re-sign their own players. The good news, though, is coming off a miserable, 5-11 season it's not like they have a lot of unrestricted free agents they absolutely can't live without. LB David Harris had 95 tackles in 15 games for the Jets this season, which was his 10th with the team. The 32-year-old had just 0.5 sacks in 2016 after racking up 4.5 in 2015 and 6.0 in 2014. Nick Mangold missed eight games due to ankle injuries this past season, last playing on Dec. 5 against the Colts. The 32-year-old Mangold has a cap hit of $9.075 million next season, after which he is eligible for free agency. So, should he stay or should he go? Jets center Nick Mangold will still have to wait two or three weeks to see if he needs surgery on his injured ankle but he still wants to play next season either way, he told reporters Wednesday. Despite being limited to just eight games this year, Mangold said he would like to continue playing into next season, the final year of his contract with the Jets. It's still uncertain whether or not injured center Nick Mangold will play on Monday night against the Colts. With lack of creating turnovers, the team has been working hard in practice to get them. "We [are] trying everything we can to get them," Bowles said. "It's just not falling our way right now." WR Devin Smith has returned to practice and has no restrictions on what he can do. So far, according to Bowles, Smith is almost caught up with the offense. Bent: This was as frustrating a loss as the Jets have experienced all season. While it's easy to take consolation from the fact that the game was essentially meaningless and that losing the game might even be for the best in the long run, it's always unbearable to lose to the Patriots. Despite missing the last three games with an ankle injury, center Nick Mangold said he is hopeful he can play come Sunday. Mangold said he continues to feel better as the days go on. However, he was limited in practice Friday and is officially listed as questionable for the matchup against the Patriots. New York Jets head coach Todd Bowles said he doesn't have an idea of when center Nick Mangold will return from his ankle injury that has kept him out for the past three games, according to the New York Post's Brian Costello. Mangold, 32, did not practice Wednesday and has missed three games in a row for the first time in his career. He has been in and out of a walking boot for the past few weeks, which has clouded Bowles' idea of when he may return. "For me, if you're not practicing, you're not improving," Bowles said. "I haven't seen him run yet ... he's not doing anything that I see." SNY NFL Insider Ralph Vacchiano identifies three keys for a Jets victory on Sunday against the Rams. THE GAME: The Los Angeles Rams (3-5) at the Jets (3-6) at the Meadowlands on Sunday, Nov. 13 at 1 p.m. ET. THE WEATHER: After the cold winter winds blow through over the next few days, it should be a beautiful fall day again on Sunday with sun, light Meadowlands winds, and a temperature hovering around 60. T Ryan Clady has a torn rotator cuff and had been "basically playing out there with one arm. Ben Ijalana will start in his place on Sunday. LB Bruce Carter and CB Marcus Williams are unlikely to play Sunday.